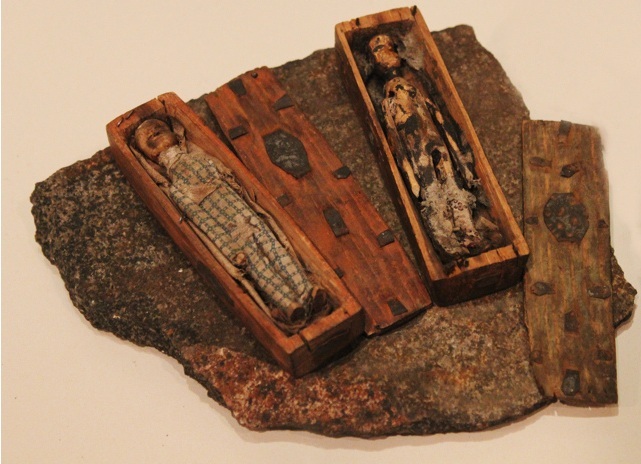 I was recently in Edinburgh for the really incredible Sensualising Deformity conference, and while there I was reminded of my one of my favorite museum objects, in the National Museum of Scotland: the mysterious little coffins of Arthur’s Seat. In 1836, five boys were hunting rabbits on the north-eastern slopes of Arthur’s Seat, the main peak in the group of hills in the center of Edinburgh. In a small cave in the crags of the hill they stumbled across seventeen miniature coffins carved in pine and decorated with tinned iron. Carefully arranged in a three-tiered stack, each coffin contained a small wooden figure with painted black boots and individually crafted clothing. At the time of their discovery, some speculated that they were implements of witchcraft; others suggested they were charms used by sailors to ward off death or even mimic burials for those lost at sea. There is also a provocative theory that the little figures are tributes to the seventeen victims of famed Edinburgh serial killers Burke and Hare, as the figures were found just seven years after Burke’s execution. However, all of the figures are dressed in male attire, whereas twelve of Burke and Hare’s victims were female. Interestingly, some of the figures have arms while others have had theirs removed to fit in their coffins, perhaps suggesting they were not originally made to be buried. Allen Simpson and Samuel Menefee (of the University of Edinburgh and the University of Virginia, respectively) carried out a detailed study of the figures in 1994, and have suggested they were adapted from a set of wooden toy soldiers manufactured around the 1790s, but not re-clothed or buried in the cave until the 1830s. But this is really the extent of knowledge about them. (See this wonderful and well-researched article by Mike Dash at A Fortean In The Archives for more details). 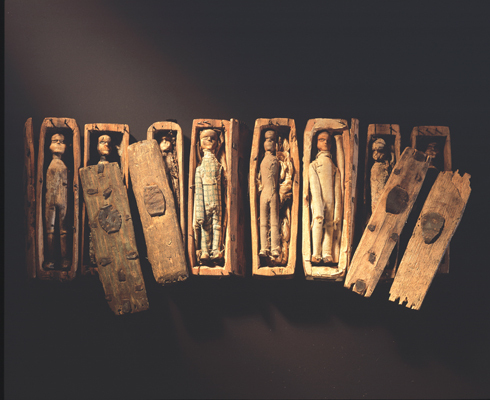 Only eight of the original seventeen coffins and figures still survive today: several disintegrated with age, while others were “destroyed by the boys pelting them at each other as unmeaning and contemptible trifles” (according to The Scotsman, 16 July 1836). These remarkable objects still remain a mystery today, but with the recent digitization of 19th century newspapers like The Scotsman, Mike Dash suggests there might be potential for new revelations if anyone can match them to an obscure report of a shipwreck or accident with seventeen male victims. Do you have any alternative theories? When I first saw them, I thought of a mother carving them for stillborn or miscarried children: portraits of the sons she never got to raise, made from the toys they never got to play with. Images from the National Museum of Scotland (here and here), and Alpha Victor. Visit A Fortean In The Archives for more fascinating details about these objects from history writer Mike Dash. I first read about these in Charles Fort’s “Book of the Damned”. He had his own, completely orthogonal, ideas – the ones presented here make much more sense. Thanks for this. They were little boxed up dolls that were hidden in the cave by a child and forgotten. Perhaps the child died before he or she could retrieve them. What a marvellous possibility. They are well made, and years ago,children often worked toys and things out of wood. They could have had a special spiritual/psychic purpose for thier maker too. Carl Jung, the famous psychologist and investigator of the human psyche and human soul, carved a small wooden man or two, and then a box that they lay in, and his them away in the rafters of an outdoor building, and for years, he tells, they helped him in his psychotically survival through his childhood. The fact that they were stashed away in a dark secret place, was very important to hi.. These coffins seen so much to me to be possibly a similar thing. That was my idea as well. Also If they had been made to be in “coffins” it seems their eyes might be closed and not open? able to already have compiled a new screenplay. is really fruitful in support of me, keep up posting these articles. I’d forgotten all about these. If you like the weird and are ever in Edinburgh, do pop along to the National Museum to spot the Arthur’s Seat coffins. Maybe to represent émigrés gone, never seen again. I’m excited to uncover this page. I need to to thank you for your time just for this wonderful read!! I definitely loved every bit of it and I have you saved to fav to see new stuff in your website. They are a child’s toys. Several years after the child passed his mother got tired of crying over them, carved little boxes (not coffins) and hid them in the cave. She only wanted them to be gone without destroying them, so that her boy could come play with them if he ever desired to. It’s heart breaking to see them recovered, they should have stayed in the cave. The boy is sad and lonely, and his mother now cries over them again. Please remove these images and stop looking at them. I�m impressed, I must say. Actually hardly ever do I encounter a weblog that�s each educative and entertaining, and let me tell you, you have got hit the nail on the head. Your thought is excellent; the difficulty is something that not enough persons are speaking intelligently about. I’m very happy that I stumbled across this in my search for something relating to this. I just visited your Pinterest at a glance. I will look thoroughly – it seemed like there were several treasures. Beautiful coffins and dolls, a truly fascinating story. Thank you for sharing it. I picked up a newsletter at the German National Museum in Nuremberg when I was doing research last summer. Apparently it isn’t unheard of for corpses sealed up beneath stone church floors to mummify, and a pair of them were found in 1811 when a crypt at the Johanniskirche was opened. A copperplate engraving illustrating the mummies was made, as well as a small pair of mannequins reproducing the mummies as they had been found. I have an idea. I read Carl Jung’s autobiography, & he told of how he created a little maniken in a coffin-like box from wood, which he then kept hidden away outside under something. It was a personal secret, & needed to be secret becuase the little man in his box was very important to developing his own separate sense of self- a personal ritual. I also kept private things I made-for the purpose of keeping my secret-self intact- people do such things, children as well as adults. It is possible that these were the private ritual of an individual child-or adult, placed in the cave because of a special- IDIOSYCRATIC- meaning . They may be something personal to the psyche of one individual. I think they are beautiful too … & I think they’re from someone with a crafty hobby! I remember that they crop up in an Ian Rankin novel. That’s where I first heard of them. Oh, and Arthur’s Seat’s the remains of an ancient volcano. They are beautiful. I too think that it is possible they symbolise the burial of those deceased who did not have the chance to be buried. A missed opportunity to ritualise mourning. I agree with this theory as well. A strong theory with a lot of history to back it up. As the daughter of antrhopologists and a wood carver with a lifelong interest in antique wooden toys, I do not believe they belonged to a child. Toys made for children have a different emphasis in the details. They’d also be more likely to represent femals – at least some of them would. They are far more similar to tokens that are found in graves and meant to represent people left behind. I do not think they were made to represent someone’s individuality either. Individualization is a modern concept. As for them being made by someone crafty, it has long fascinated me that we really don’t find ‘collectables’ from the past. In the rare instances where people had time on their hands, they decorated purposeful items, rather than make something useless. Again, a modern concept. One of the nice things about discussions like this is they highlight just how much the world has changed, and how completely we’ve forgotten the old ways of the world.